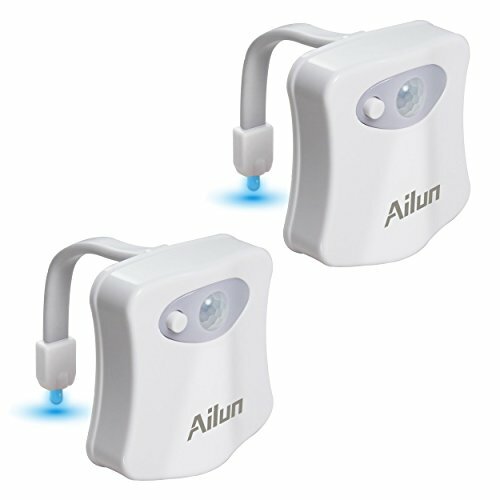 Ailun designs, develops, and sells all kinds of Cell Phone Accessories Kits, including but not limited to Cell Phone&Pad Protective Cases, Screen Protectors, etc. Ailun appoints Siania as an exclusive distributor on Amazon, all sales of Ailun printed products shall only from Siania. Motion-Activated LED Sensor: The LED Toilet Light with high quality light sensor and motion sensor, it will automatically turn on when detects movement and stay on for 2 minutes after last movement, protecting your kids from stumbling around in the dark. Ultra-water resistant and can be cleaned with most household cleaners. No more messy cleanups! It is a dream to find your way easily and safely without any worries, the choice of modern life. Creative lighting design: Choose between 8 single colors or color-cycle, this toilet night lamp is going to make your toilet beautiful and easy to use at night. You can keep One Color or Color Rotation on this bowl of light. Easy to Install and Clean: Operated by three AAA batteries(1.5V)(Battery not included), which can be easily get and change. Simple design makes it easy to clean. [12-Month Warranty] The pack includes two nightlights in total and was packed in one Package. Designed with a soft and flexible PVC neck that can be bent easily to conform to any toilet type, regardless of the shape of the bowl. If you have any questions about this product by Ailun, contact us by completing and submitting the form below. If you are looking for a specif part number, please include it with your message.